2 Gang 2Way 10Amp Bakelite Switch Brown Dome on a Light Oak Mounting Base. Our Bakelite switches are available with either a brown or white dome. The Bakelite range has been designed, manufactured and finished to sympathetically recapture the nostalgic feel of 1930's and 1940's interiors. 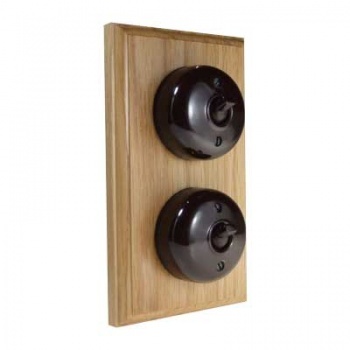 The Bakelite range fits standard wall boxes and an adaptor plate for mounting is supplied with each switch. We Supply a free adaptor plate for mounting for this Bakelite switch to flush wall boxes (this applies to all Bakelite switches on our website).